We specialize in below grade superior waterproofing practices. We provide protection for waterproofing systems and managing sub-surface water. We offer air vapour systems designed to withstand the most extreme conditions. 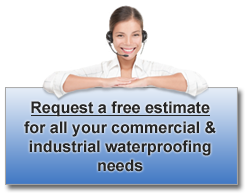 We are proud to provide waterproofing services for all of Southern Ontario. Our service areas include but are not limited to; Cambridge, Kitchener, Waterloo, Milton, Mississauga, Toronto & GTA, Niagara Falls, Barrie, Kingston, Brampton, Hamilton, Oakville, Owen Sound, Parry Sound, Peterborough, Sarnia, and more! Conestoga Waterproofing is based out of Cambridge, ON and specializes in waterproofing solutions for all types of commercial, industrial and institutional buildings. We understand the special technical requirements needed for commercial waterproofing and we get the job done right! Conestoga Waterproofing strives to provide our clients with the most competitive line of waterproofing systems possible that encompass the newest technology in waterproofing. Staying on the cutting edge of waterproofing technology is no easy task, but it enables us to provide the best possible solutions to you, our customer. With Conestoga Waterproofing, you can be sure that you are receiving the most effective solution for your needs. Conestoga Waterproofing is certified to install various types of waterproofing systems such as Henry/Bakor, Tremco as well as other Manufacturers. We also install drainage and tile systems that protect the structure while diverting moisture away from the substrate. Conestoga Waterproofing offers a large depth of experience and knowledge in repairing and installing durable sealing applications. We take great pride in our workmanship and produce a top-quality product in a highly efficient and cost-effective manner. We are committed to the safety of our workers and pride ourselves on our excellent track record of safe work practices. We believe that quality workmanship along with quality products is the formula for success. Our comprehensive Waterproofing Services are performed throughout Southern Ontario and we are ready to tackle your project today!